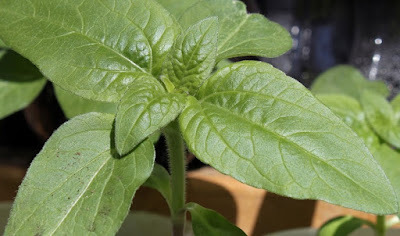 Sunflowers are easy to grow and really need nothing more than a sunny spot and some water. Depending on your growing season you might want to start seeds indoors. I'm in zone 5B and like to start my seeds indoors about a month before my projected last frost date. (here's how to find the last frost date for your zone). If you want to direct sow, wait till your soil reaches at least 55°F, preferably warmer. Check seed packet for exact sowing information. If no information (like if you want to plant some of your chickens BOSS) sow seeds about 1" deep in soil amended with compost. Keep soil moist during germination. Sunflowers prefer a well draining soil and 6-8 hours of sun. You'll also have to check your seed packets for exact spacing, but in general the larger the sunflower the further apart they need to be. Mammoth sunflowers should be about 2 feet apart and dwarf varieties as close as 6" apart. Mulch well to help keep moisture in the soil. You may have to cover the seedlings if a sudden frost pops up. Sunflowers need a bit more water than most flowers do. Make sure to water your sunflowers at least once a week. More if the soil dries out. As sunflowers grow their flower buds turn to face the sun as it moves through the sky. This is called heliotropism. Once the flower is mature it will settle into a fixed position. The plant stalks were green up till now but as the flower starts to work on seed production the stalks will yellow. Some of the largest varieties might need staked once they grow to their full height. I like to plant them next to the garden fence then use soft rope or strips of old t-shirt material to tie them up if they start to fall over. If they hang too far over the chickens (and squirrels) will help themselves to the seeds they can reach! 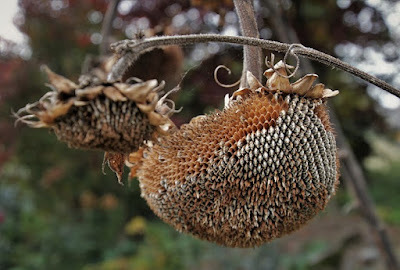 After the sunflower matures the head will start to droop and dry out. The stalks will turn brown when the flower heads are ready to harvest. You'll now be in a race with the wild birds to see who can get to the seeds first. To prevent birds from eating all the seeds, you can tie a mesh bag around the flower. I usually just cut the flower heads off after the petals have dried up and fallen off. I put the flower heads in a warm, dry place to dry out. The drier the seed heads are the easier it is to remove the seeds. To remove the seeds, wait until they are dry enough that they pop out with very little pressure. Simply rub your fingers against the seeds and they will pop out. Do this above a bucket or a large sheet to collect the seeds as they fall. Watch an utterly hypnotizing Instagram video of Laura from You Should Grow deseeding a dried sunflower seed head. To store seeds long term you'll want them to be completely dry to prevent mold, so allow them to sit out in a dry room for a few days or pop into the dehydrator on low for a short while. Once seeds are completely dry, save them in a cool dry place. I use mason jars. There are 2 ways to feed sunflower seeds to your chickens. You can either harvest the seeds from the seed heads and feed them to the chickens that way, or just let them peck the seeds out of the seed heads themselves. The easy way is to just give the whole seed head to the chickens and allow them to pick the seeds out themselves. This is a great idea in winter if the chickens can't go out because of the weather. It will keep them busy for awhile as they have to work a little to get to their treat. You can also hang the seed head by threading a ribbon through the center to make it a little more challenging. The downside of this is that the seed heads take longer to dry out if you don't pull the seeds out. You'll have to check them often to make sure they don't mold. The area where the stem attaches takes the longest to dry out, so keep an eye on that. Feed sunflower seeds to your chickens by themselves as a treat or use to make these easy seed treats. Either way, your chickens will love their fresh sunflower seeds and you'll be able to cross that purchase off your feed store shopping list! Related reading: How to grow love Lies Bleeding Amaranth as a feed source for chickens.